— I’ve just finished a draft of a novella-length memoir charting the dissolution of my thirteen-year long collaboration/friendship/fascination with an extraterrestrially off-kilter actor and musician named Fred. We met in late 2000 when I cast him to play a chorus teacher who gets mocked and humiliated by a class of junior high students in my autobiographical short film, Mr. Rose. As I learned more about him during the production process I started feeling like I’d discovered the jackpot of eccentrics and for the first few years I knew him it seemed like he’d reveal some wonderfully bizarre detail about his life every time we were together. There were no combination of buses that would get Fred from his apartment to his school, Rowan University, and even though he’d hung up flyers around campus seeking a ride share and gotten his professors to allow him to get up before his classes at the beginning of each semester to explain his situation and beg for a ride nothing had ever come together, and he was forced to walk. “I’d tell everyone I’d pay half gas but all of these kids at this school were spoiled,” he said with a shrug. I remained skeptical, and to prove himself a few weeks later Fred produced a laminated copy of an article that had chronicled his journeys to and from school. I borrowed the copy of the article as part of my research for a documentary about his life that I’ve never finished and it’s been a permanent fixture on the walls in my life ever since. When Fred first revealed his walking tale to me I was immediately compelled by the Herzogian image of a man stubbornly walking along the highway alone in the dead of winter, a duffel bag loaded with oversized textbooks dangling from his hand. The article revealed that he’d suffered through numerous encounters with the cops – walking on the highway is illegal in NJ–and had even had a gun pulled on him while being searched one cold December morning. I also loved how his story took the cliche’ idea of “back in my day we had it really tough, we had to walk through three miles of snow to get to school” to such hilariously grotesque lengths. What I found strange was how he seemed to revel in the unique absurdity of his walking tale, proud that it made him an especially rare person, deserving of attention, while never once acknowledging how painfully sad it was. He came across as a total oddball so I could understand his classmates not wanting to commit to the intimacy of being alone in a car with him day after day, aside from the nightmare of coordination such an act of charity would have required in the world before cell phones, but still, once his struggle became public knowledge someone should have been courteous and decent enough to come to his aid. Yet nobody ever had, and Fred claimed with a smile that he was forced to walk for years and was even singled out by the dean of students during his graduation ceremony for his dedication to obtaining his degree. I’m always charmed by desperate acts of deception and if my experience is enriched by a victimless fib then I appreciate the other person making the effort to entertain me. 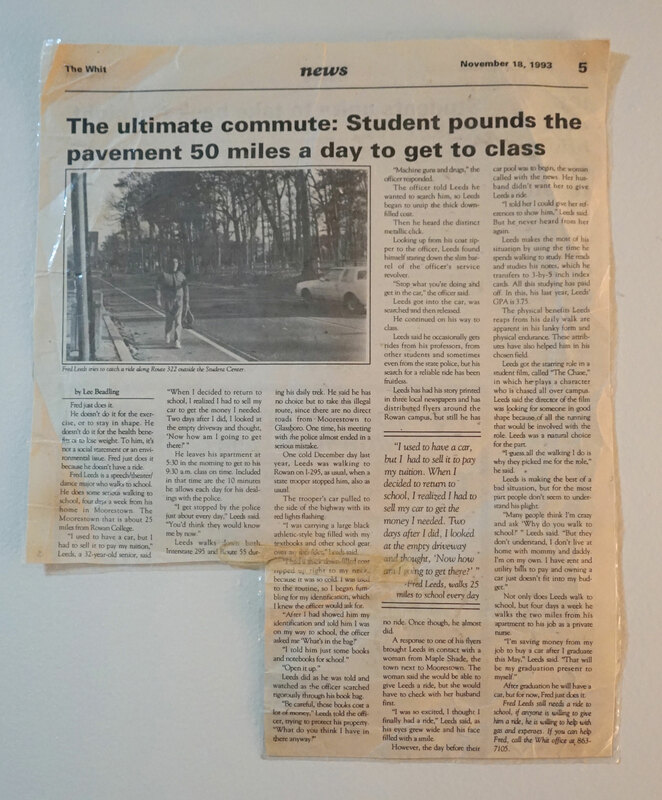 So now, as I sit here after living with this story and having this weathered, laminated article in my possession for all these years, what I value most about it is how I doubt it even really happened. Walking 50 miles a day is impossible. That’s a cold, irrefutable fact. But Fred’s been living out this and many other strange tales for decades. And that was the real gift of knowing him. To share in his warped, mysterious, unfathomable, truth. Jason Giampietro was born in New Jersey and moved to the East Village in the early 2000s. He’s a cofounder of Magic Square Films and has written and directed the short films THE SUN THIEF and WHIFFED OUT, both of which played at BAMcinemaFest and The Maryland Film Festival, and HERNIA, which screened at the New York Film Festival. As an actor he appeared in Nathan Silver’s STINKING HEAVEN. In addition to his directorial work Giampietro is known for his street photography, which he posts through his instagram, named The Village Voice’s best local instagram. He has also written and recorded music as part of Mighty Moon and Daylight’s for the Birds.